4. 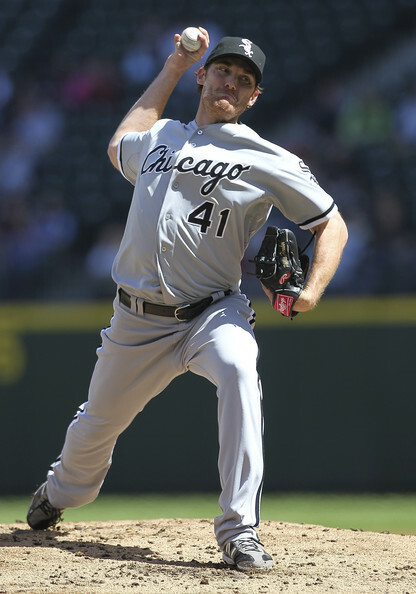 How many of you knew who Philip Humber was last week at this time? Be honest. I bet almost all of you know who he is now. Humber deserves it. He appears to be a real class act both on and off the field. The Nationals are no fluke. Their rotation is arguably the best in baseball. Matt Kemp continues to lay a vicious assault on National League pitching. And Bobby Valentine is likely wishing that he never traded places with Terry Francona. The matchup of the week occurs in Arlington. New York Yankees at Texas Rangers: The last three American League Pennants have been won by these two red-hot teams. It’s AL East versus AL West. These are the two most lethal offenses in all of baseball at this point in the season. The only difference is Texas has had great pitching to this point as well. Texas features a +52 run differential and have won nine of their last ten. With this series being played in Arlington, and the absence of Nova (will not start any of the three games), I give the two-time defending American League champions the edge. The Rangers will take two of three. This is a huge stretch for the Yankees though in that they travel home for a three-game set against the AL Central leading Tigers right after. 3. Sunday is “Melo Time.” For the third consecutive Sunday, Carmelo Anthony stole the show. Also, I thought that Metta World Peace was supposed to make peace? I guess he wasn’t feeling “peaceful” on Sunday when he landed the elbow heard around the world to the head of James Harden. Despite these ridiculous antics, the Lakers also proved themselves in a big way with a major comeback victory against a very good Oklahoma City team. Any time a good team heads into the fourth quarter with a 16-point lead like OKC did on Sunday, it is absolutely inexcusable to lose. I still have a ton of confidence in the Thunder, but yesterday’s meltdown would make anyone a bit uneasy. 14 of the 16 playoff spots have been clinched as we head into the final week of the regular season. The matchup of the week takes place in Salt Lake City tomorrow night. Phoenix Suns at Utah Jazz: What teams currently hold down the 8th and 9th spots in the Western Conference? You guessed it. Only one game separates the Suns and the Jazz as both teams continue to fight for their playoff lives. This is one of those games that is basically for all the marbles. Utah has won three in a row, while the Suns have faltered as of late. The Jazz are an outstanding home team that is playing their best basketball at the right time. Unfortunately for Phoenix, they struggle on the road. And though I would be extremely disheartened to watch the playoffs minus Steve Nash, this will be the game that breaks the Suns back. Utah will live another day and receive the grand prize of going against San Antonio or Oklahoma City in Round one. 2. Andrew Luck. Robert Griffin III. And then? The time has finally come. After all the months of speculation, the NFL Draft is set to start on Thursday night. The mystery will begin with pick number three. Over a three day period, 253 players will hear their name called and their lives will change forever. 1. In professional sports, I dare you to find me a consistently more competitive and unpredictable opening round than the one the NHL has. Last year we were spoiled with four Game 7’s during the first round. This year, there will be at least one that we know of, and potentially more. The defending champs scratched their way to a thrilling overtime victory yesterday to force a Game 7. Vancouver, te defending Western Conference champions were shocked in five games by the eighth seeded Kings. And the mighty Detroit Red Wings went down. I know that hockey is Canada’s sport and typically a very minor sport for most Americans, but the NHL playoffs are can’t miss television. This entry was posted in Miscellaneous and tagged AL Central, AL East, AL West, American League, Andrew Luck, Bobby Valentine, Boston Red Sox, Carmelo Anthony, Detroit Red Wings, Detroit Tigers, Florida Panthers, French Open, Ivan Nova, James Harden, Los Angeles Lakers, Matt Kemp, Metta World Peace, New York Rangers, New York Yankees, NFL Draft, NHL, Novak Djokovic, Oklahoma City Thunder, Phil Humber, Phoenix Suns, Rafael Nadal, Robert Griffin III, San Antonio Spurs, Steve Nash, Terry Francona, Texas Rangers, Utah Jazz, Washington Nationals. Bookmark the permalink.